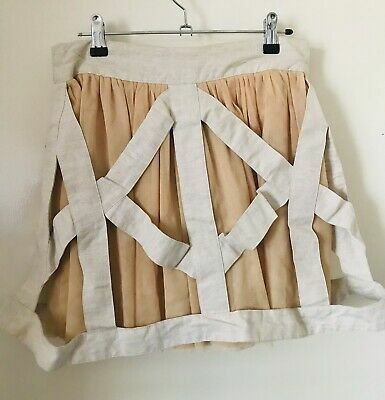 I was initially drawn to what I thought was a skater skirt but the title was ambiguous and after reading the description I was more confused. What is the fake part? What does one actually receive? Even the page formatting is wrong. denimini wrote: What the ....??? color - kilt tartan and the coordination with the tights leggings complimented with the type of footwear. So the answer is the FAUX part is the presumption that the garment is a 2 piece outfit because it looks that way. .................. So the answer is the FAUX part is the presumption that the garment is a 2 piece outfit because it looks that way. Thanks for such a comprehensive description and answer! Seems like one would need to go into a cubicle to have a pee. Not exactly eBay, but this looks quite interesting, only if a bit tight. andrewsh wrote: Not exactly eBay, but this looks quite interesting, only if a bit tight. Yes, it would need a quite a bit of elastane in the mix. I notice that the sizing stops at 14 which puts a sizeable slice of even the female population out of the running. Asian sizes once again. A pencil skirt and too long so not for me. Having got one and tried to wear it for about ½h, I can conclude it is indeed a bit tight to be comfortable to walk in. I guess I’m filing a return tomorrow. Pencil skirts, generally, are mainly for trying to look cute in but not necessarily function in. There's a reason I gravitate to A-line designs -- I need to be able to walk around comfortably. A design like the one pictured would hobble me to the point where I'd not be able to navigate gracefully (and "gracefully" is a variable term with me). andrewsh wrote: Having got one and tried to wear it for about ½h, I can conclude it is indeed a bit tight to be comfortable to walk in. I guess I’m filing a return tomorrow. You could get the shears out and cut it off to a shorter length, frayed hems are OK To maintain a normal stride a skirt needs to be an A-line, pleated or very short. A previous female neighbour, who I had never seen wearing a skirt, was inspired by me wearing skirts in summer. One day she wore a pencil skirt to town and tried to step up onto the kerb as she normally would; her stride was curtailed sufficiently for her foot not to reach the kerb while the momentum of her body continued, culminating in a fall in the street! (in a skirt!). She related the story to me in a manner that I was somehow responsible. They don't live there now and she probably will never wear a skirt again. Not April Fools methinks but certainly a different look. With a tweek or two, that would appeal to the experimenter in me. I'd start with the colour and length but the overall idea is attractive. I'd probably want the "tapes" full sewn to the basic skirt to give it a more structured look too. Now imagine that in a Union Jack Red/White/Blue with black trimming should cause quite a scene. How about the St. Andrew's Cross, blue skirt and white tapes? Could be done very easily. I won't mention any others. STEVIE wrote: How about the St. Andrew's Cross, blue skirt and white tapes?